There were a few restaurants that I regretted missing out on when they closed. L'Orangerie was a big one, then Bastide. Another was Citrus at Social. 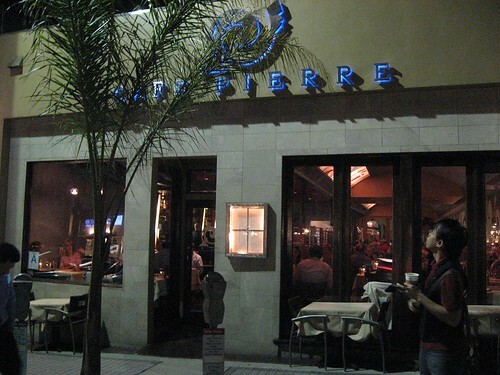 So when a media invite came from Cafe Pierre in Manhattan Beach bearing the name of Remi Lauvand, formerly of Citrus at Social, I was quite happy to accept. On a weeknight, the small restaurant was packed (even without our crew's help) so I was at first surprised that they bothered inviting us for dinner, but they pointed out that most of their clientele consists of an older crowd and they want to reach out more to the youngsters. 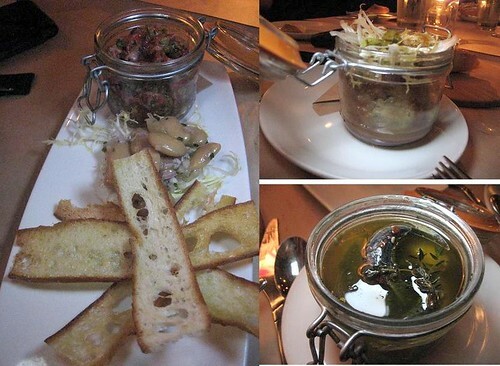 hand-cut prime bavette beef tartare and shelling beans ($14), head cheese with frisee and mustard dressing ($8), pig trotters ($8), and sardines. I really liked the pig trotters (so fatty and tender!) and the beef tartare. The foie parfait was also very good, smooth and rich complemented well by the sweet gelee on top. The sardines we all had trouble deboning on the table so that although we liked how they tasted they were rather difficult to eat. 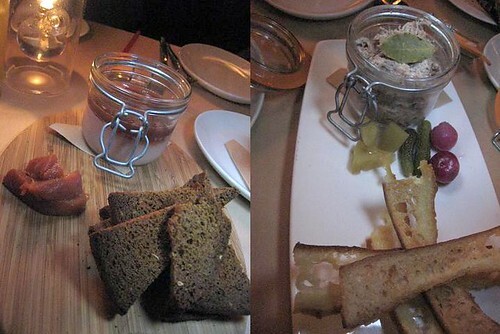 Apparently we shouldn't have stuffed ourselves with the jars since those weren't even appetizers. Again, we all shared an assortment of appetizers. 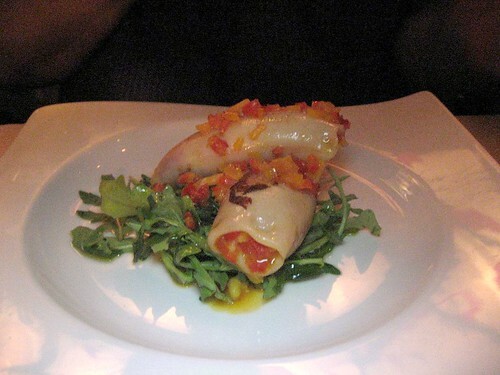 Stuffed baby calamari, sweet pepper, saffron, wild arugula ($14). The two bites I had of this were pretty good but a bit bland for me. The texture of the stuffing didn't seem to quite work with the chewiness of the squid. 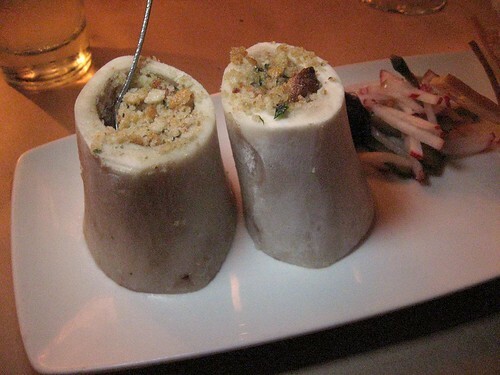 Roasted bone marrow, pickled radish, red wine onion compote ($11). House-cured Tasmanian trout, lemon, serrano, honey mustard ($13). I was very happy to have a light and healthier dish to balance all the other rich appetizers with! 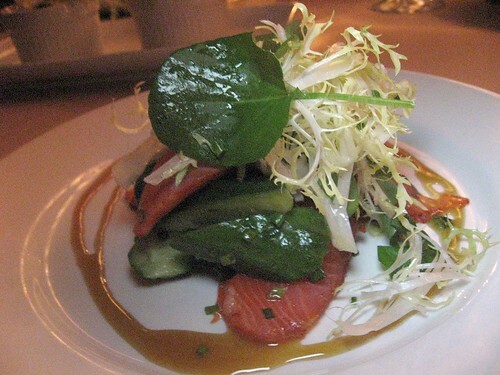 The simple looking dish became one of my favorite appetizers with the amazing house cured trout and the fresh greens. The sausage, made with the shoulder and belly meat, was divine. 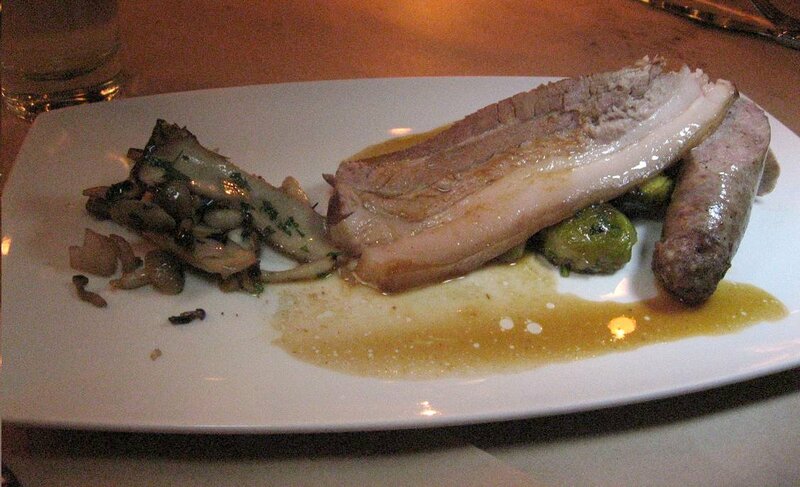 I couldn't stop munching on the brussels sprouts drenched in pork fat. Making this dish even more special is Sinosoul pointing out that Jude Becker is the farmer featured in Michael Pollan's Omnivore's Dilemma. He finished feeding a portion of his hogs on acorn, and this time Remi Lauvand got 50 lbs of it. FoodGPS also counted this as his favorite pork dish that week. Now, I did say the dish was a special but if you want to try it, Cafe Pierre will be serving it again next Tuesday, March 9! 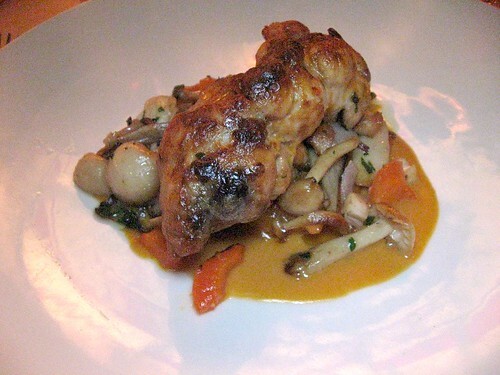 Veal sweetbreads, roasted carrots, parmesan jus ($28). Before asking Remi directly we had a debate on what kind of sweetbreads this was. We thought it couldn't possibly be veal since it was so big! This dish managed to showcase the texture of sweetbread yet somehow tasted less "offal-y" than most. 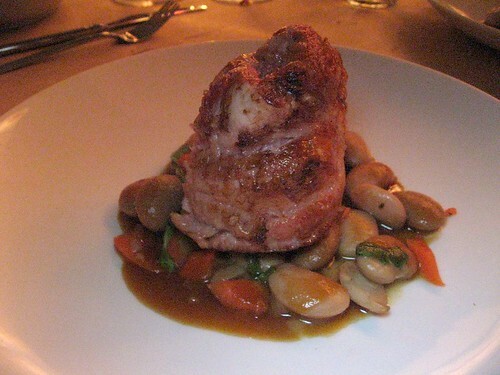 We had another veal dish, equally good: Veal breast, shelling beans, arugula, jalapeño veal jus ($24). Another dish I enjoyed very much was the 70 hour braised short ribs. I don't care if short ribs had gotten a bad rep for being a cheap cut among foodies, I love them all the same and I'd pay for that 70 hour cooking time. The short ribs were meaty yet tender enough and held so much flavor. 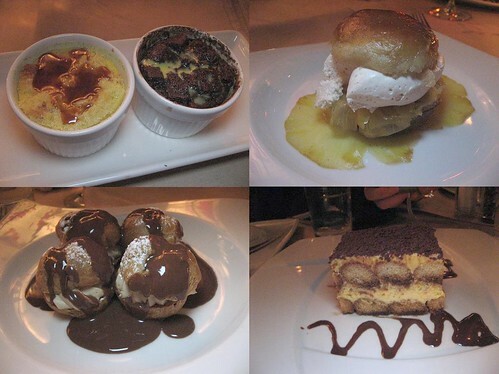 There were also a duo of bread pudding, Baba au rhum, profiteroles, and tiramisu. 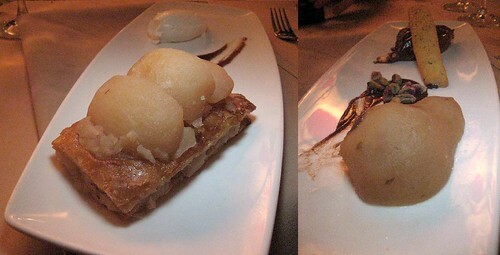 My favorite was the baba au rhum (and sounds like LA&OC Foodie and WeezerMonkey agree). It's just the combination of the tang from the slices of poached pineapple hidden inside, that cream, and of course the rum-soaked dough. I'm glad I finally got to try chef Remi Lauvand's creation, and glad that Manhattan Beach now has a dining destination of this caliber. With Remi helming the kitchen, Cafe Pierre not only is worthy as a Manhattan Beach favorite, but stands up to restaurants in LA and makes Manhattan Beach worth the drive. Especially next Tuesday, March 9. You know ... when chef Lauvand gets more acorn fed hog and feeds it to you as part of a 3 course menu ($50). Gourmet Pigs eat gourmet pigs! This place looks great! Love that stuffed squid. Can you taste the acorn-fed difference of those hogs versus conventional pork? I guess it would be hard to compare unless you have both meats side by side and prepared the same way.